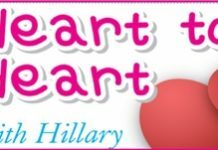 Home Blogs Heart to Heart with Hillary Hillary an author? I think you should collect all your writings into a book. I reckon it would have to be a great hit. I have work mates overseas who read you every week, just for the laugh at the idiots who write in. I’ll buy the first copy if you’ll autograph it. It is always nice to know that the readers enjoy the column, especially people like Big D from the USA who sends chocolates with his letters. (Thanks again Big D!) and hint, hint, Reg. At the editorial office we actually have discussed putting some of the best letters together, but it is a lot of work, Reg my Petal. Maybe it will be something for me to do when I retire, because I haven’t got the time at present. You have no idea how long it takes me to climb up the stairs (I wish the editor would install a lift). I’ll let you know if we do it and I’ll autograph that first copy just for you. Of course the first copy will be more expensive than the others, so in true fashion for these parts, there will be around 1,000 first copies, just like the third 50 percent share of many bars that is sold so often! By the way, I would rather your friends laugh at my answers, rather than at the readers! Previous articleHow much money you make? Next articleNoodle for the doodle?